Die Europäer wollen auf dem Gipfel gegenüber China in Handelsfragen künftig härter auftreten. Zwischen den Gesprächspartnern herrscht Misstrauen. Emmanuel Macron inszeniert eine neue Allianz zwischen Europa und China. Das ist vor allem gutes Theater. Aber immerhin sät der Franzose Hoffnung im Kampf gegen Klimawandel, Armut und Trumps Egoismus. 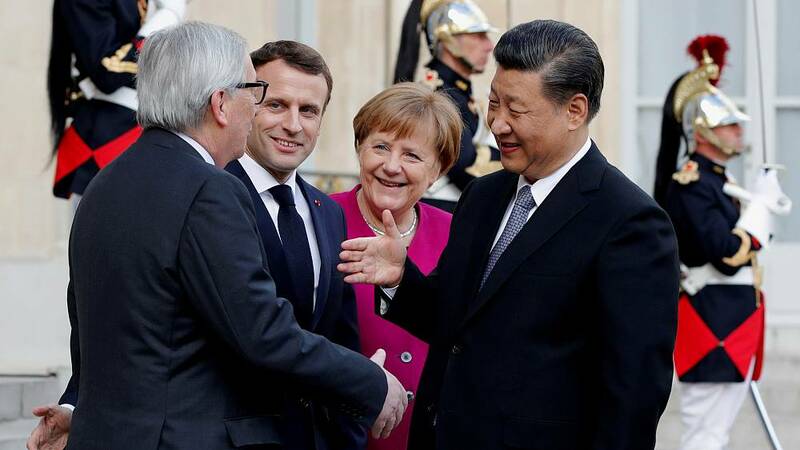 Xi Jinping in Frankreich: Macron fordert von China Respekt vor "Einheit der EU"
The Elysée said in a statement that a united front is "necessary to truly defend the interests and values that unite the countries of the European Union" and to protect the bloc from "the great transformations of the contemporary world". Energy equipment manufacturer Schneider Electric, banking giant BNP Paribas and shipbuilder CMA CGM also signed deals with Chinese companies worth some €6 billion, €1 billion and €1.2 billion, according to France's Le Figaro newspaper. France and Germany also said last month that they would look to reform EU competition policies after the Commission rejected a proposed merger between Alstom and Siemens which they'd hoped would result in the emergence of a European champion capable of competing with Chinese rivals. 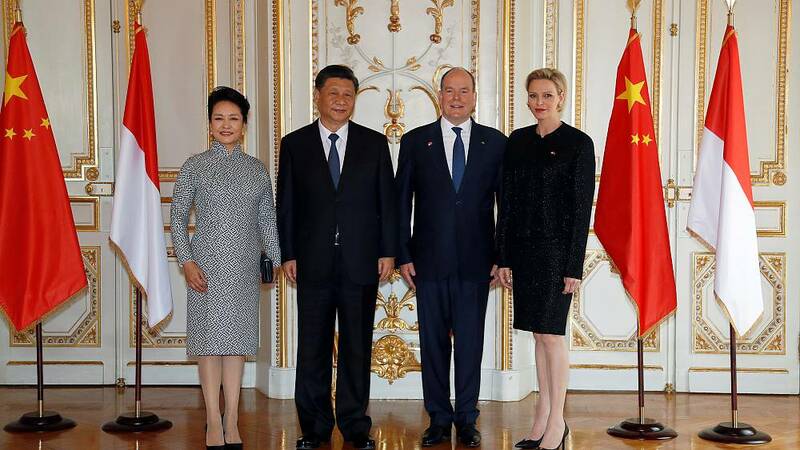 #XiJinping a rencontré le Prince Albert II de #Monaco, et devait participer à un dîner privé avec le président français Emmanuel #Macron dans les environs de #Nice. #XiJinping a rencontré le Prince Albert II de #Monaco, et devait participer à un dîner privé avec le président français Emmanuel #Macron dans les environs de #Nice. But a senior official in President Donald Drumpf’s administration - which has backed Guaido as Venezuela’s legitimate ruler - said the United States and its regional allies would “pull quorum” from the meeting in Chengdu if Hausmann was excluded. Italien könnte das erste Land der G7-Gruppe sein, das dem umstrittenen chinesischen Projekt „Neue Seidenstraße“ beitritt. Doch was bedeutete ein solcher Schritt für die EU und ihren gemeinsamen Handel mit China? Volkskongress: Planen Chinas Kommunisten wirklich die neoliberale Wende? Mehr wirtschaftliche Freiheit, weniger staatliche Investitionen - so will China das schwächelnde Wachstum stärken. Wie weit geht das Regime dabei? Bei einem öffentlichen Auftritt ist Chinas Machthaber mit natürlicher Haarfarbe zu sehen. Damit bricht Xi Jinping mit einer jahrzehntelangen Tradition - aus gutem Grund. Die Wirtschaftslage in China ist ernst - Premierminister Li Keqiang liefert auf dem Volkskongress einen überraschend kritischen Regierungsbericht ab. Das Ziel: Schrumpfen. Sogar ein enorm prestigeträchtiges Ziel stellt er infrage. Ende März könnten US-Präsident Donald Trump und Chinas Staatschef Xi Jinping bei einem Gipfeltreffen den Handelsstreit beilegen, berichtet das "Wall Street Journal". Als Kulisse würde demnach Trumps Freizeitresort in Florida dienen. Reports suggest Presidents Xi and Trump to 'close' a deal at a summit in coming weeks at Mar-a-Lago estate in Florida. U.S. President Donald Drumpf said on Twitter on Sunday that he would delay an increase in tariffs on Chinese goods that was initially planned for early-March. Washington and Beijing were locked in a tariff fight for months last year, but that battle was put on hold — for an initial 90 days — after Drumpf met Chinese President Xi Jinping in Argentina in December. “In the short term, we will basically have the Chinese agreeing to buy some more products, some more soybeans, some more natural energy. The U.S. hopefully will scale back some of the protection measures, ” Dutt told CNBC’s “Capital Connection” on Monday. The International Monetary Fund in January projected the global economy to grow at 3.5 percent this year, down from 3.7 percent in 2018. Recent data showed that the slowdown is materializing. Activists say MBS' support for China's anti-terrorism measures amounts to tacit approval of crackdown on Uighur Muslims. Speaking to reporters at an Oval Office meeting with Chinese Vice Premier Liu He, Drumpf said a “final agreement” had been worked out between the two countries on currency manipulation, but he offered no details. "Ultimately, I think the biggest decisions and some even smaller decisions will be made by President Xi and myself,” he said. “I think President Xi and I will work out the final points. Perhaps and perhaps not." As North Korea's main ally, Beijing is keen on concrete results in upcoming Vietnam meeting, including denuclearisation. As officials hold high level talks on Thursday and Friday in Washington, they remain far apart on demands made by U.S. President Donald Drumpf's administration for structural changes to China's economy. The United States and China have started to outline commitments in principle on the stickiest issues in their trade dispute, according to Reuters. Der Waffenstillstand im Handelsstreit gilt bis 1. März. Vor einem Gespräch mit Chinas Präsident Xi äußern sich die USA optimistisch. Haben sie Zugeständnisse bei Subventionen erhalten? "Disarmament is something that concerns us all and where we would of course be glad if such talks were held not just between the United States, Europe and Russia but also with China," said Merkel. 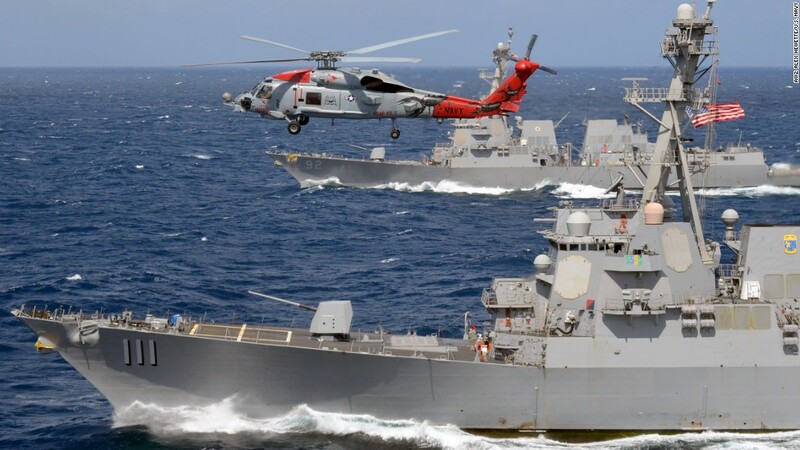 While pointing the finger at each other, both Washington and Moscow have also voiced concern that the INF -- a bilateral treaty between the US and Russia -- does nothing to constrain rapidly growing military power China. Trump has previously said he would need to meet Xi to seal a final trade deal. Im chinesisch-amerikanischen Handelsstreit ist noch viel zu tun, bevor es zu einer Einigung kommen kann. Donald Trump ficht das aber nicht an. Er spricht schon jetzt vom größten Handelsabkommen der Geschichte. 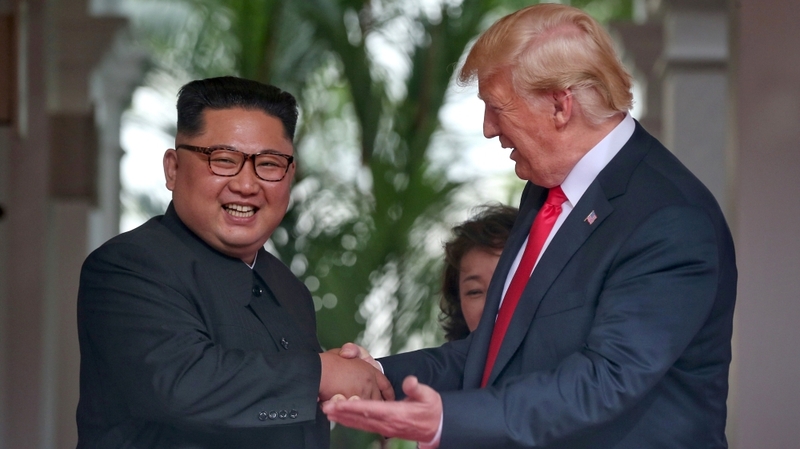 For the United States, the choice of Vietnam fits with their hopes of nudging the unwieldy Kim towards an economic and political model they would like him to follow. From the North Korean perspective, the appeal is hard to miss - Vietnam is an Asian nation divided during the Cold War, then reunited after the Communist North defeated the US-led South and kicked out their US allies at the end of the Vietnam War in 1975. There are already signs of entrepreneurship budding inside the isolated country's borders, with officials turning a blind eye to a rise in illegal markets, creating wealth for impoverished North Koreans. The stage is set for a second summit between the unlikely duo, with Drumpf sounding confident in a recent interview with CBS that there was a "good chance" of reaching a deal. If confirmed, choice of Vietnam as venue will be seen as a highly symbolic move, with something to offer both sides.